Residents in south Donegal have been left in shock at a plane which has been flying very low over towns throughout the day. This picture shows the plane passing out of view over Frosses this morning. 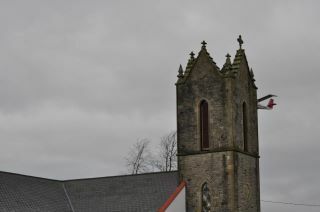 There have been further reports of the plane circling Ballyshannon and Ardara flying just above rooftops. It is believed the plane is part of a survey being carried out in the border regions known as the Tellus Border survey.